Spectrum Writing creates student interest and sparks writing creativity. The lessons, perfect for students in grade 1, strengthen writing skills by focusing on describing words, writing sentences, creative writing, sequencing, and more. Each book provides an overview of the writing process, as well as a break down of the essential skills that build good writing. It features easy-to-understand directions, is aligned to national and state standards, and also includes a complete answer key. Today, more than ever, students need to be equipped with the essential skills they need for school achievement and for success on proficiency tests. The Spectrum series has been designed to prepare students with these skills and to enhance student achievement. Developed by experts in the field of education, each title in the Spectrum workbook series offers grade-appropriate instruction and reinforcement in an effective sequence for learning success. 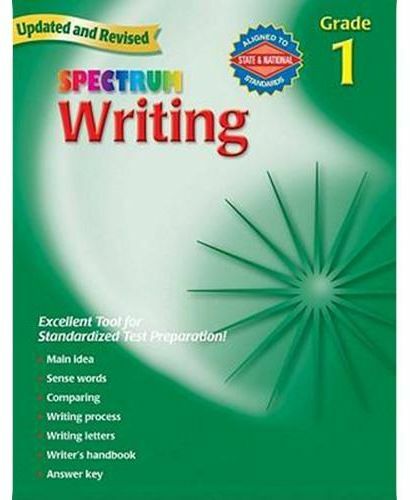 Perfect for use at home or in school, and a favorite of parents, homeschoolers, and teachers worldwide, Spectrum is the learning partner students need for complete achievement.